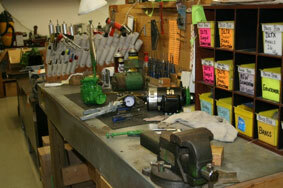 Robert’s Carburetor Repair and our complete tractor shop, The Motor Works are committed to preserving living history. We want to keep grandpa and great-grandpa’s legacy alive for the next generations. Those of us who already work here take great pride in what we do. Customer service and top quality products are our main goals. While our business continues to expand, we are striving to keep the small town feel of a family owned business. That’s what will allow us to keep those goals and our customers, our number one priority. If you agree with our philosophies, then check out what openings we have available. One of them may be your perfect match. Robert’s Carburetor is currently looking for qualified persons to work in our carburetor restoration shop. We work on carbs for vintage equipment such as the John Deere 2 cylinder and New Generation tractors. Zenith and Marvel Schebler manufactured carbs off other types of equipment are among some of the other most commonly restored models. We are a complete restoration shop—we do not just soak and paint anything and call it restored and we also do not work on anything automotive. Extensive time and care is taken tearing each carburetor down to clean up the housing and parts inside. Each individual part and casting is examined thoroughly before we decide if it can be reused or must be replaced or repaired. Following reassembly, carbs are painted, leak checked and then test run on our engine and dyno. Magnetos, governors and distributors are also restored through our carburetor shop. Qualified individuals must be detail oriented and have close attention to detail. They must also be willing to learn our methods and be able to adapt to changing situations. An understanding of how a gas engine and carburetor work are necessary as is the ability to understand, comprehend and apply the theory of operation and principal of operation. A large part of the job description consists of tear down, cleaning, inspecting, reassembly and testing of all the items worked on through the carb shop. The Motor Works is our complete tractor shop where we work on anything from the 2 cylinder up through current production John Deere models. We offer individual repair work—anything that can shipped or delivered we can repaired. 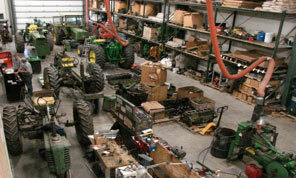 We also do complete ground up restoration on the entire tractor or implement. Tractors, combines, lawn mowers…if it’s John Deere green our tractor shop will fix it. Tractor shop employees need to be familiar with agricultural equipment, especially JD 10, 20, 30, 40 & 55 series, and must be a self- starter. Knowledge of mechanical, electrical and hydraulic systems as well as the ability to understand what needs to be done and the follow thru to get it done correctly and in a timely manner are extremely important. Also important is the ability to adapt to changing situations and projects. Tractor shop work will consist of complete mechanical work on the entire unit. The only piece of restoration work not done in our shop is the finish paint. Please be aware that these job opportunities are located in Spencer, Iowa. Employees must reside in or be willing to relocate to northwest Iowa. Housing or moving benefits may apply for qualified applicants. Anyone interested in applying for a position with us will need to provide a resume, references and a cover letter detailing their qualifications. Robert’s Carburetor Repair is an equal opportunity employer. Holidays, paid time off, and health care coverage are available for full time positions. We request serious inquiries only. The Motor Works is our complete tractor repair shop while Robert’s Carburetor Repair is the antique repair side. J & G Regional Services, Inc.